We foolishly assume some things about the Earth will always be the same. Sure, it is safe to assume the sky will always be above our heads[assuming, there is no asteroid hits], but to think that compass needles will always point to the geographic north, for instance, is pure folly. Doing so is what is leading to all the fuss over the South Atlantic Anomaly, a region of the Earth’s magnetic field that, as researchers reported in Geophysical Review Letters, has shifted so much that satellites get disrupted when they fly through it. In the paper, published in February, the researchers presented evidence gathered from southern Africa that could help us get a better idea of what the heck is going on the South Atlantic Anomaly, which spans from Chile to Zimbabwe. It definitely is weakening, though there are a number of reasons why that might be happening. 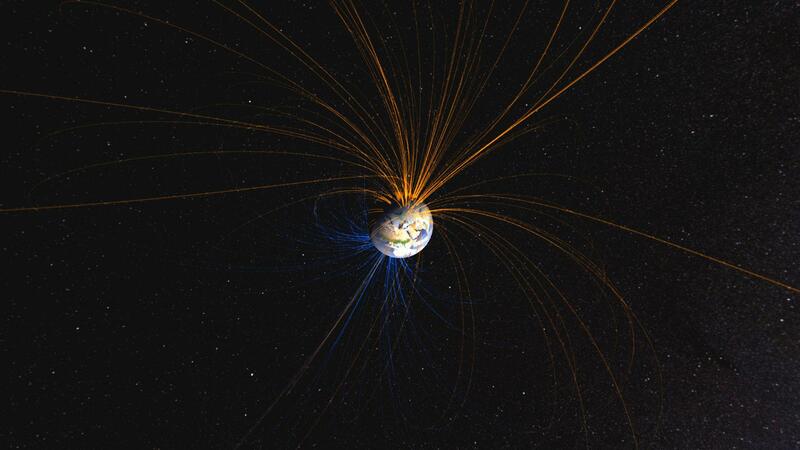 The fact is that Earth’s magnetic field reverses polarity relatively often — on average, every couple million years. A million years is a really long time, but when you place these magnetic field reversals in the grand scheme of the Earth’s billions of years of geological history, they’re pretty darn frequent. As the researchers note in their study, that process might be happening again — though the actual make-up of the Earth’s mantle beneath the field may have something to do with it as well. The Earth’s magnetic field is our first defense against the solar wind, which is full of charged particles that can, in turn, destroy the ozone layer, which protects us from ultraviolet radiation from space. To get a better idea of what’s going on in the South Atlantic Anomaly and whether similar events have happened before, researchers looked to spreading seafloors formed as magma cooled. Crystals in the magma, they surmised, would tell them which direction in the Earth’s magnetic field was polarized. Over thousands and millions of years, these polarized seafloor minerals formed parallel stripes of reversed crystals that give us a record of past reversals. A similar phenomenon resulted from the activities of Iron Age people living in the northern part of modern-day South Africa. They’d regularly burn their grain bins and mud huts in a ritual meant to alleviate drought conditions, and in doing so, they created the proper conditions for their clay to cool in the same way the seafloor did, with the minerals in the clay pointing in the direction of the magnetic pole. By examining the archaeological relics from several sites, researchers pieced together the history of the South Atlantic Anomaly from about 425 to 1550 C.E. and found similar anomalies in three different ranges of years: 400 to 450 C.E., 700 to 750 C.E., and 1225 to 1550 C.E. They conclude that the fluctuations that are happening now are probably not a coincidence or random occurrence but are actually part of a historical trend of magnetic field fluctuations in this region. The reason this region is so prone to fluctuations is also not random. Some 1,800 miles beneath southern Africa is an area called the African Large Low Shear Velocity Province, a heavy region that might be pressing down on the hot liquid iron at the Earth’s core that is responsible for generating the magnetic field in the first place. “We’re getting stronger evidence that there’s something unusual about the core-mantel boundary under Africa that could be having an important impact on the global magnetic field,” John Tarduno, Ph.D., study co-author and chair of the Department of Earth and Environmental Sciences at the University of Rochester, said in a statement. Historical fluctuations and unusual iron flow can’t totally explain the overall trend in Earth’s weakening magnetic field, which geologists also attribute to forces within the Earth’s mantle, but they can help us place what we’re seeing into context. And that context is that the 160-year trend in a weakening magnetic field, which could herald the big flip, seems to be happening alongside these smaller, less frequent fluctuations. While time will tell just how serious it all is, it’s clear now that there’s not much we can do to stop the big flip when it comes.